On the minimum wage, it appeared that this did not allow for a decent standard of living, as it was below the amount needed to keep people above the poverty line, and this was contrary to the Covenant, and [the Expert] asked what would stop a country as wealthy as Canada from implementing a minimum wage that provided a decent standard of living. I don't know what sort of expertise the The Expert is supposed to have, but the answer to his question is this: the minimum wage is a remarkably ineffective instrument for dealing with poverty. Labour demand curves slope downward in rich countries, too. Update: A longer discussion of the effects of the minimum wage on employment and poverty is here. What with the comments on Mark Thoma's posts of Paul Krugman's earlier attempts to explain economic methodology to non-economists and the apparent publication bias in favour of significant results in political science and in economics, George Box' dictum is worth repeating for those who are too sceptical of models, and for those who aren't sceptical enough. I've spent half an hour on the WEF site, and I can't for the life of me figure out what they're measuring. Or why it matters. The competitive process that shifts market share towards more productive firms accounted for about two thirds of aggregate labour productivity growth in Canadian manufacturing from 1989 to 1999, according to a new study that examines firm turnover and productivity growth. Why the rush to ink more deals? Where free trade is concerned, Canada is getting worse with practice: Now Ottawa is racing to seal a deal with South Korea. If trade with Korea then follows the same pattern as under our first five free-trade agreements, our imports will grow by 250 per cent in 10 years, our exports by 100 per cent, and our deficit with Korea will widen from $3-billion to $13-billion. That will destroy more than 33,000 jobs across a swath of Canadian industries -- including 4,000 in the auto industry. This is eerily reminiscent of our actual free-trade experience with Mexico. Our exports are up, but our imports are up much more. Our deficit with Mexico ballooned from $3-billion to $11-billion. In fact, we'd be lucky to do that well with Korea. Unlike Korea, at least with Mexico we have (weak) supply-chain links that benefit from Mexican growth. And Korea's sophisticated technology and continuing interventionist policies will make it much harder to crack its markets. The trade officials have one thing right: We are badly missing out on Asia's economic miracle, and must do something dramatic to offset existing trade imbalances. But the historical evidence is overwhelming that free-trade agreements make matters worse, not better. We need a much more complex, sophisticated, and far-reaching industrial strategy to address Asia's competitive challenge -- applying some of the same policy tools the Asians themselves have so successfully used. The reason for advocating trade liberalisation is not that it makes it easier to export things to other countries; the gains from trade are due to the fact that consumers can now buy things more cheaply than they could before. Although net exports are necessarily zero-sum - the gains from trade most definitely are not. I'd be more sympathetic to this sort of argument if we were facing a US-type trade balance; there might be some merit to deferring a trade deal that might exacerbate a pesky current account deficit. But that's not the case. there are suprisingly many papers with results that are just barely statistically significant (t=1.96 to 2.06) and surprisingly few that are just barely not significant (t=1.85 to 1.95). in a selection of empirical studies in political science; Mark Thoma wonders if this extends to economics as well. I'm pretty sure it does, although perhaps not to the same extent. There is a case for excluding superfluous explanatory variables: if a right-hand-side variable really does have a 'true' coefficient of zero, there are efficiency gains to be had by imposing a correct restriction. But careful researchers are also aware of the perils of interpreting the results of 'pre-test estimators' that first test for significance and then re-estimate using only the RHS variables that pass a significance test. The standard errors for this estimator are not what the regression package might report. As a Bayesian, I'm not ashamed to report results in which the posterior mean is (say) one posterior standard deviation greater than zero. Although a frequentist might think that the coefficient was not significantly greater than zero, I'd note that there's about an 85% posterior probability that the coefficient is positive. And in any case, a good model isn't one with tightly-estimated parameters; any model with a sufficiently large sample size will give you arbitrarily large t-statistics. The true test of a model is out-of-sample prediction. 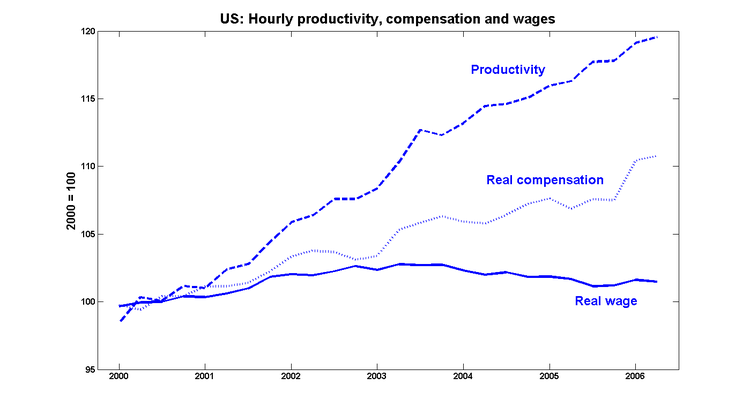 Several commenters on the previous post on the apparent disconnect between productivity and wages in the US pointed out that the choice of the deflator used to calculate real compensation might be a partial explanation. The standard theory of the firm expresses the real wage in terms of the price of output - not the price of consumer goods. Unfortunately for me - and for Econbrowser's Menzie Chinn, who made the same mistake - the BLS series for real compensation is deflated by the CPI index, not by the GDP deflator. (Thanks to tom in the comments for pointing this out). But using the correct deflator turns out to be only a small step towards explaining the puzzle. 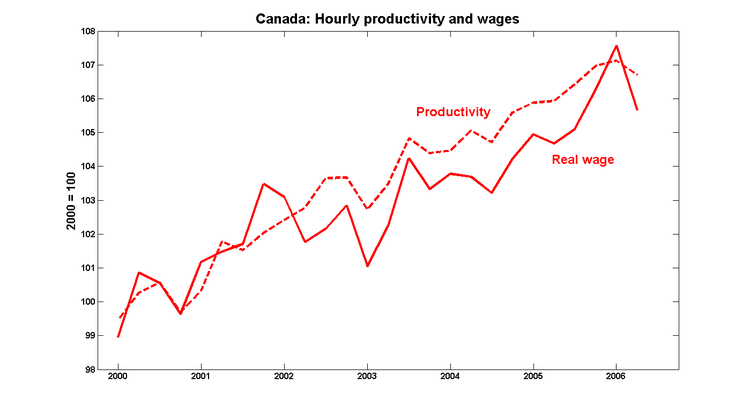 Why are wages tracking productivity in Canada, but not the US? 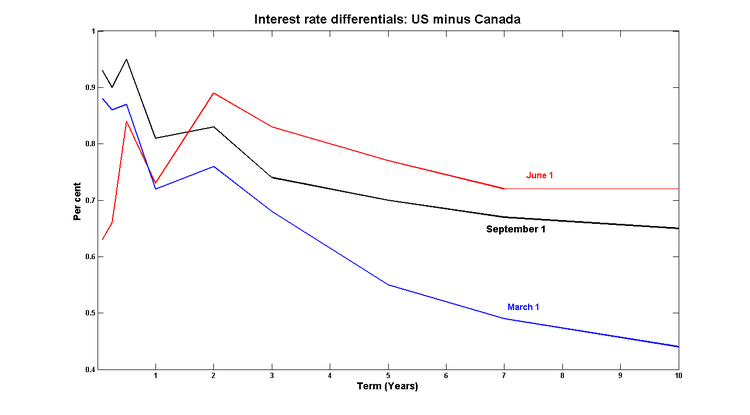 The Canadian counter-example provides a useful check for possible explanations for the US 'disconnect'. For example, consider the hypothesis that US real wages are being held back by competition from low-wage countries such as China. This is a plausible story - we'd expect wages to converge eventually - but it doesn't square with the Canadian experience. If anything, we'd expect the effect to be even stronger in Canada, what with the 40% appreciation of the CAD against the yuan since 2002. So the challenge is to come up with an explanation for the US disconnect that wouldn't also predict a disconnect in Canada as well. Update: Comments here and in Mark Thoma's link to this post have asked for data sources for the Canadian numbers. The productivity series is real monthly GDP (CANSIM series v14182657) divided by hours worked as reported by the Labour Force Survey (v4391505). The hourly wage is labour income (v1996473) divided by hours worked. Unfortunately, it'll likely cost you CAD $9.00 to reproduce that graph. I also looked at other series - notably real weekly earnings - and I saw that they were also increasing. Update2: A follow-up post on using the GDP deflator vs the CPI to calculate real wages. Central bank issues stimulus warning: Bank of Canada cautions provinces, Ottawa on plans for budget surpluses: The Bank of Canada has issued a rare warning to federal and provincial governments that they should not use their windfalls to take actions that would overheat the Canadian economy and provoke inflationary pressure. The economy is operating at close to capacity, a senior bank official said yesterday, and governments -- some of which are unexpectedly flush with cash this year -- need to keep this in mind when making fiscal decisions. While the Bank of Canada's comments are too late to sway much in terms of government spending and taxation policy this fiscal year, governments are now gearing up for next year's budgets. As well, elections are pending in Ontario, and possibly Quebec and at the federal level as well -- which usually mean higher levels of spending. "It's more of a warning into next year's budget season," said Douglas Porter, deputy chief economist at BMO Nesbitt Burns. The central bank probably wants to avoid a repeat of the 1980s, when monetary policy was trying to slow down the economy but governments, especially Ontario, were spending money as fast as it came in, he said. "It's a preliminary shot," said Peter Dungan, economics professor at the University of Toronto. "It reinforces the idea that we are close to capacity, so don't rock the boat." 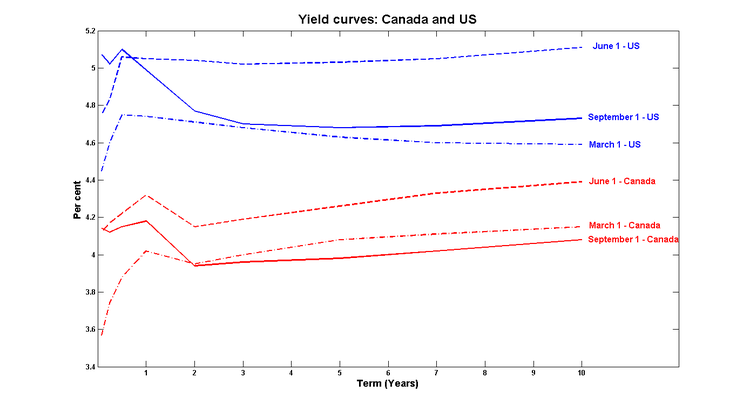 On the other hand, if the US economy does slow down over the next few months and reduces imports from Canada, then that extra fiscal stimulus could be useful in maintaining aggregate demand. Yet another quarter in which Canada had a current account surplus, only to see its net international investment position (NIIP) deteriorate after revaluation. Even though Canada has an accumulated current account surplus of $156b since 2000, CAD appreciation (40% against the USD since 2002) has meant that the NIIP has improved by only $68b during that time. The Canadian economy continues to perform robustly, benefiting from its strong macroeconomic policy framework and the boom in global commodity prices. The main risks to the outlook are external, including the possibility of a sharper-than-expected slowing in the U.S. economy and a disorderly adjustment of global imbalances that could result in a substantial further appreciation of the Canadian dollar. With wage growth decelerating and CPI inflation well contained, the Bank of Canada recently halted the process of monetary tightening that had begun in September 2005. A strong fiscal position remains at the center of the new government’s economic policies, with the FY2006/07 budget including welcome commitments to lower public debt (to 25 percent of GDP by FY2013/14), contain expenditure growth, and reduce the tax burden on the corporate sector. Would it be petty of me to think that a G7 country deserves just a wee bit more attention? Oh well, at least they regularly included us in their statistical tables, which is more than I can say for a certain well-known UK publication. ...and why we should start worrying that it may not be falling fast enough. 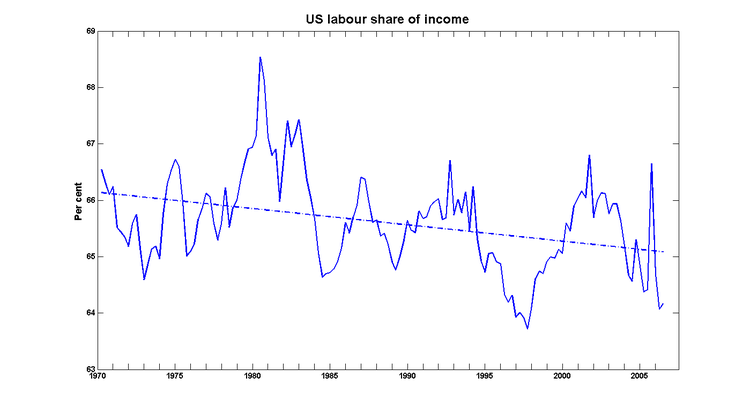 This ratio is countercyclical (profits are more volatile than wages), and although its range of variation is large enough to dominate the secular trend, the trend is negative; since 1970, labour's share of output has declined by about two percentage points. Several commentators (for example, Angry Bear) have expressed concern. While the labour share was dropping by two percentage points, the retirement-age group was gaining two points on the rest of the population. 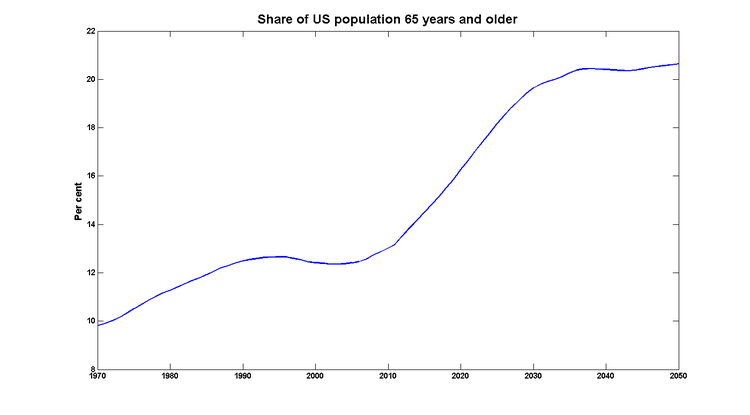 If people continue to claim a not-insignificant fraction of national income after they retire, then one of the implications of an aging population is a smaller share for those who are still working. 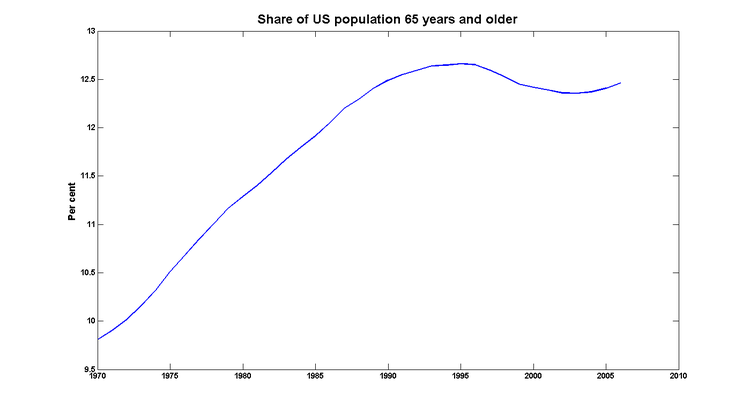 Unless retirement benefits are cut drastically over the next generation (still a possibility, of course), we should expect the labour share to decline even further. Voters cool to GST cut, Tories warned: The GST cut at the centre of the 2006 federal budget got a surprisingly rough ride from Canadians in focus groups that Ottawa commissioned to road test its fiscal plan. The Conservative Party's campaign pledge to trim the hated goods and services tax was widely regarded by political pundits as a master stroke that helped the Tories win office, even though economists panned it as the wrong cut to make. But many Canadians canvassed for the Department of Finance appeared to agree with economists, telling market researchers in focus groups that they felt there were better ways of offering tax relief. "The most frequent argument raised in many of the sessions was that the GST was not the best tax to reduce," said a report prepared for the department and obtained by The Globe and Mail. Canadians surveyed didn't buy the notion that the GST cut was the best way to deliver broad-based tax relief for all, Ottawa was told. "This statement was viewed by many individuals as not true," the market researchers said. Critics told focus group moderators they'd like Ottawa to chop income taxes or hike the taxable income threshold instead. It may be that the Conservatives won the last election despite the GST proposal, not because of it. So here I am in the corridor at the NDP convention. For some reason, the network to which I'm connected doesn't reach into the main room itself, so this will have to do. I'll be updating this post as the day goes on. The New Democratic Party of Canada is holding their biennial convention here in Quebec City this weekend. In the last election, the NDP made some impressive strides in its quest to gain credibility in economic matters, so I've decided to attend as an observer in order to see if they stay on track. Resolution 5-A9: BE IT RESOLVED that Jack Layton and the Federal Caucus vigorously promote the NDP plan to use the Bank of Canada to carry some of the public sector debt and pay the interest to ourselves instead of borrowing entirely from the private sector. (Kingston and the Islands NDP). Many other proposals are quite sensible and worthy of discussion. Of course, as an Observer, I won't be able to actually offer an opinion. But I will be interested to see if the general membership endorses the direction taken in the last election platform. Perhaps the CAD hasn't yet finished appreciating against the USD. The first in the door: It's not a massive expenditure, but the symbolism is important. Ontario has announced that it will spend $5-million on its program to promote higher education among teens whose parents did not themselves have a postsecondary education. Universities, colleges and community organizations will use the money to reach out to students and help them become the first in their family to continue their studies past high school. Another $1-million will be set aside in 2006-07 for "first generation" bursaries.